This is a conversation that appears in the movie Enter the Dragon. I started of the post with this because, the content of the whole series and experiences I wish to explain is explained in few lines in the above conversation. I feel bad when people consider a great philosopher, Martial artist and actor called Bruce lee as a mere fighter and an action star. It was my third grade and I was roaming in the ground watching a man with T-shirt and track suit commanding and the students performing some weird acts. When enquired it has been told that he is the KARATE MASTER of our school. I was curious on seeing his command over the students and the weird actions. Then I wanted to join in the Karate class and my parents told yes without a hesitation. The first day of class was about basics, stances, punches and blocks. Then the second thing he did that weekend was took me to the movie “Armour of God”, I really loved the fights of Jackie Chan. Then at that night the pillows of mine got the same hit which Jackie tried. The First class I have been taught Blocks and the first thing he told is Karate is Martial art. The aim of learning a martial art is self-defense. Then practice went for a week with punches, blocks and stances alone and with a lots and lots of exercises. Warming up was the name given and I had no idea of why is it called so (come on I was 3rd standard kid; don’t expect me to know all these things at that time itself). I practiced those in my home, a month later I was introduced to few Japanese terms. 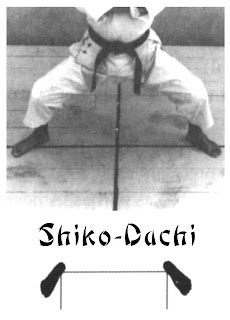 Stances are called Daichi, and few basic stances he taught were, Heisoku Dachi, Musubi Dachi and Heiko Dachi. These three stances are the stance, that has to be taken before starting the class in the Dojo. Dojo is the place where we practice martial arts. 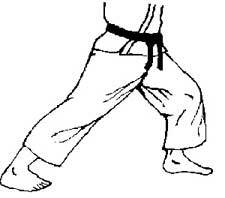 The first position is Heisoku dachi – Closed feet stance, and in that stance we start the class by bowing the sensei. Sensei is the term we used for master or teachers. Then we transform the stance to the Musubi Dachi which is V shaped stance, the angle between the toes are about 45°. Then we come to parallel feet stance where the feet are parallel and in line with shoulders, it is called as Heiko Dachi. This is the stance with which the practice of punches, blocks and so on goes. Then the Japanese term taught for blocks are uke and striking were uchi. We practiced it for a lot, then we told that the style we follow is called GOJU RYU. The meaning of the style is Hard and soft way. There is an interesting story about this style which I will share later in the upcoming posts. 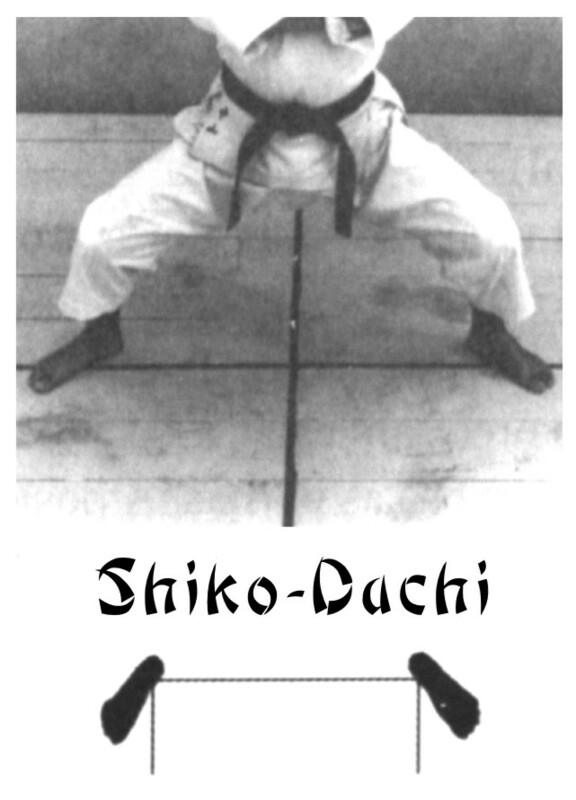 Then after a rigorous training for a month and half (at that time one and half hours twice a week and twenty minutes per day was rigorous for me) we were introduced to two new stances namely Shiko-Dachi and Senkutzu-Dachi. The former is called horse riding stance and the latter is the forward stance. The forward is checked where the body’s 70% of the weight lies in the front leg and rest at the back leg. At this stance we perform the punches and blocks and after the introduction of these stances we started doing the combination of the punches and blocks. The combination movements were a bit tough as the stance changes the techniques lost control. It was tough for me to coordinate the movement of my legs with the hands without looking at both. Then when I tried to coordinate my eyes were unable to concentrate on the target. Thus I understood the point of practicing the combination technique, it was not about coordinating the movements but rather it is concentrating on the targets without even looking at it. This practice makes the combinational techniques to be performed intuitionally and it is made ingrained in the person. The second stance is the horse riding stance and to check the perfection of the stance is the stiffness calculation. In this process mostly few people stand on each of my legs and I shouldn’t be collapsed. At first I found it irritating, and then it came to me handy (actually Leggyy). 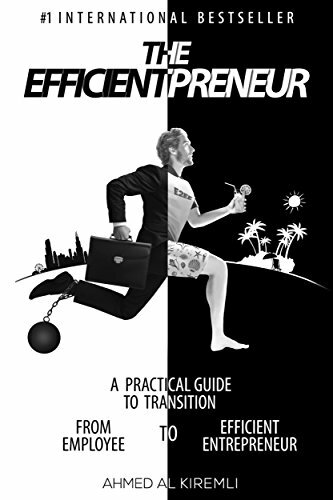 This then became my favourite stance for relaxing rather than the forward stance (I am using the English words as I don’t want to confuse my readers with Japanese words). Now I am a bit practiced and experienced with basic stances and techniques so my next stage was KATA. I will share more about Kata and the legend of the style I practiced in the next post. P.S : The Images are searched through google images and doesn't belong to me. I used it as i am not using it for a commercial purpose. From next time you can or may see me giving the pose. can you delete it? or just i am seeing it on windows explorer? Internet Explorer is showing some codes, yes, but unable to see it in blogger or in chrome.